Look carefully. The Na’vi people portrayed in James Cameron’s ‘Avatar’ sit cross-legged on the ground, hold hands, and rotate their bodies from their bellies in a circular movement. All this in a deeply-meditative trance under the guidance of their chief Shaman and High-Priestess. While immersed in 3D, keep your ears wide open. You will hear several types of tribal instruments playing soothing, calming, and rather evocative tribal music, even during the call for war. Pay attention to the didjiridoo, which plays for a short while but at the most pertinent moment. Something uncannily familiar about the music kept haunting me, like a fading memory. A few days later, in the silence of the night, I suddenly remembered! This music reminds me of my favourite album from 1998, ‘Deep Forest’, an album on which I’ve danced and meditated through several years of my life, all the way till 2006-ish. Early the next morning I rummaged through my collection, pulled it out, and danced for an hour in my room, delighted to have re-discovered it through a regression into my past from a 3D-conjured future. The movie has several other allusions to mystical concepts and practices, but I leave the joy of more discovery to your search. 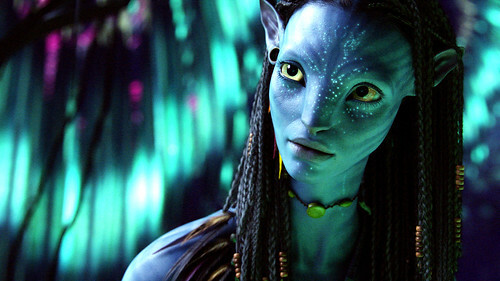 At a more basic level, the film also alludes to many Hindu philosophy and religious concepts, starting from the obvious concept of the ‘avatar’. The astral-body and astral-travel of hinduism and buddhism is re-invented by Cameron as a DNA-mutated 10-feet tall living organism. Plugging into other living beings through the ‘queue’, which are the neural strands within the hair-braid of the Na’vi, is a creative interpretation of the ‘hara’ point in zen and buddhism. The genius of the film lies not just in its technological-marvel, but in James Cameron as a shaman of our new age, channeling truths through a conjured world, unplugging us from the rigor-mortis of mankind’s decaying religions and spirital-values, navigating us in 3D back to our present-day world to our eternal truths. This is the mark of genius, the revolution of consciousness over computers and CGI.